Overheads such as electricity, heating and cooling continually eat into the profit margins of your business. With power costs continuing to rise, saving money by using energy wisely is smart business sense, as well as being good for the environment and enhancing your company’s reputation. The installation of office lighting controls will have a positive impact on your bottom line! With new stand alone technology, such a system can be relatively inexpensive, yet provide energy savings year after year. When considering lighting controls, it is important to take a look at your premises and think about which areas are used for sitting in, and working, and which areas are used for circulation. It makes sense when setting up lighting controls that lights should be set up differently in these two types of areas. If you need to leave lights on for security or cleaners after hours for example, they can remain on in circulatory areas, but in the work spaces, lights can stay off. Intelligent Environments Limited specialise in helping you make your offices as energy efficient as possible, using energy saving technology to reduce those wasted dollars where lights or heating are left on in unattended areas, or offices are continually over lit. These areas of energy saving add up, and have a positive impact on your bottom line! With light level sensors your office lighting control system can be designed to take advantage of natural light levels and use less artificial lighting wherever possible. Luminaires can be ‘grouped’ so that ones near to the windows can be dimmed, or switched off, while leaving staff at the darker end of the office with full artificial lighting. If an office lighting control system is installed, when offices are vacated, the lights can be controlled to turn off automatically. Instead of being permanently lit, presence detectors can ensure low traffic areas are lit only when necessary, saving energy + reducing costs. Using daylight and occupancy sensors to reduce unnecessary lighting in corridors can be a key source of energy saving. As can the use of occupancy sensors in bathrooms/toilets, to ensure lighting turns off when the areas are vacated. It must be borne in mind however that people don’t like to step into a darkened area and have to wait for lights to come on. 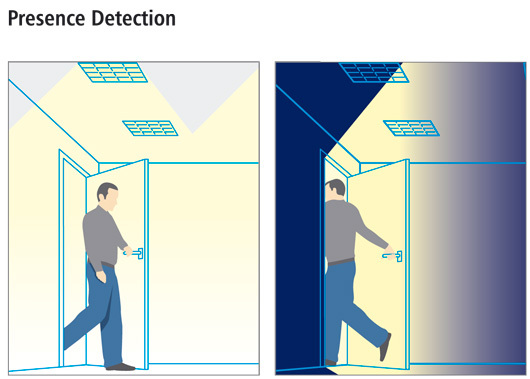 Careful thought as to the placement of sensors can ensure lighting comes on ahead of the person entering the area. If a staff member is working late, occupancy sensors will override pre-set lighting programs to provide safe pathway lighting. The standard office lighting control set up will be automatically overridden to ensure safety always comes first. The successful Australian NABERS method of rating commercial buildings for energy efficiency and sustainability has arrived in New Zealand. NABERSNZ™ has been released making this an excellent time to assess energy use in your office building, and to create an energy management plan for your organisation. With careful planning and design an office lighting control system can maximise your return on investment. Substantial savings are often made from reduced maintenance and energy consumption. Call us today for a free consultation.